In our last blog past, we discussed the relationship between your oral health and your overall health, noting that inflammation in your mouth can lead to other health conditions. Specifically, the inflammation we were talking about was a common condition known as periodontal disease, or gum disease. When gums become inflamed, it’s because of bacteria and plaque. When this inflammation isn’t treated, pockets can develop between the soft tissue of the gums and your teeth. That’s what gives bacteria and plaque access to the bloodstream and, from there, other parts of the body. Scaling and root planning are procedures that let Dr. Goldstein clean below the gumline to rid teeth and gums of harmful plaque and bacteria. Arestein, meanwhile, is a topical antibiotic that provides patients with long-lasting protection against bacteria. It’s applied below the gumline in our office and goes to work immediately, releasing powerful medication over time to deliver painless treatment. Have you noticed a change in how your gums are doing? Don’t put off your next visit any longer. Call Dr. Goldstein’s Randolph dental office today to schedule your next visit. 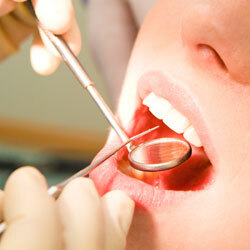 We recommend that you see Dr. Goldstein every six months for a regular cleaning and exam. That way we can help you stay on top of your oral health. Schedule your visit with us today if you live in Randolph, Rockaway, Mendham, Chester, Morristown, Denville, Morris County, and surrounding areas.